Even robots can’t tear their eyes from a beautiful sunset. NASA’s Mars Curiosity rover pointed its high resolution mast camera at the setting Sun to capture this 4-image sequence on April 15 at the conclusion of the mission’s 956th Martian day. While it resembles an earthly sunset, closer inspection reveals alien oddities. A day on Mars lasts 24 hours and 39 minutes, so sunrise and sunset follow nearly the same rhythm as they do on Earth. When we eventually establish a base there, astronauts should be able to adjust to the planet’s day-night rhythm with relative ease. Jet lag would be worse. But sunsets and sunrises offer a different palette of colors than they would on Earth. For starters, the Sun only radiates the equivalent of a partly cloudy afternoon’s worth of light. That’s because Mars’ average distance from the Sun is 141.6 million miles or about half again Earth’s distance. Increased distance reduces the intensity of sunlight. Not only that, but the solar disk shrinks from the familiar 0.5° across we see from Earth to 0.35° at Mars. Here on the home planet, your little finger extended at arm’s length would cover the equivalent of two Suns. On Mars it would be three! What about color? Dust and other fine particles in the atmosphere scatter the blues and greens from the setting or rising Sun to color it yellow, orange and red. When these tints are reflected off clouds, sunset colors are amplified and spread about the sky, making us reach for that camera phone to capture the glory. Things are a little different on Mars. The ever-present fine dust in the Martian atmosphere absorbs blue light and scatters the warmer colors, coloring the sky well away from the Sun a familiar ruddy hue. At the same time, dust particles in the Sun’s direction scatter blue light forward to create a cool, blue aureole near the setting Sun. 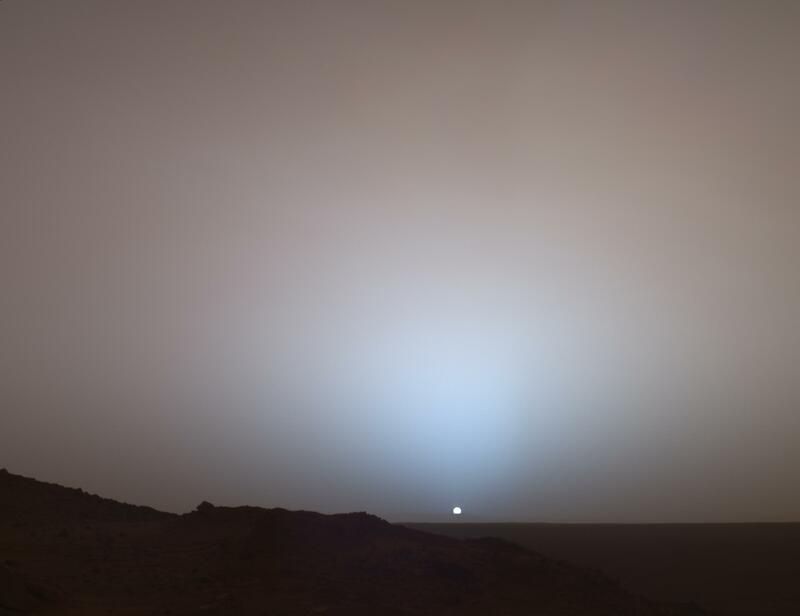 If you were standing on Mars, you’d only notice the blue glow when the Sun was near the horizon, the time when its light passes through the greatest depth of atmosphere and dust. 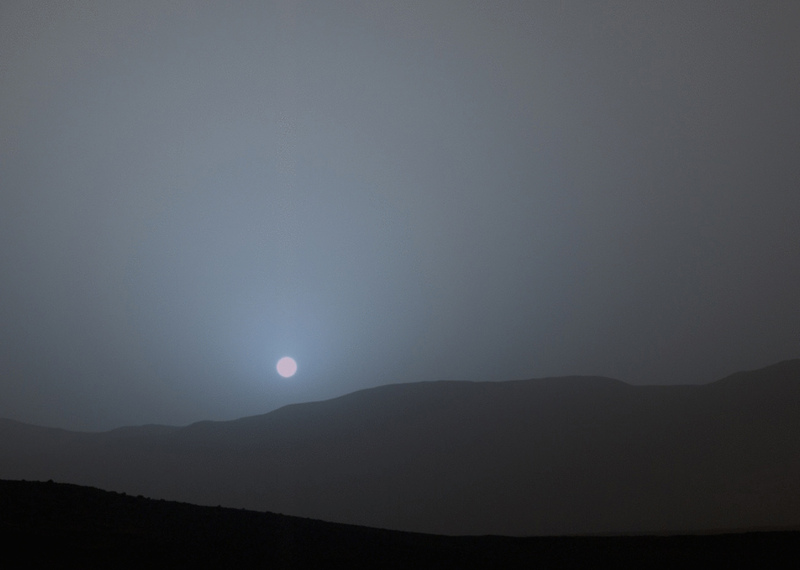 This was the first sunset observed in color by Curiosity. The color has been calibrated and white-balanced to remove camera artifacts. Mastcam sees color much the way the human eye does, although it’s a little less sensitive to blue. The Sun’s disk itself appears pink because all the cooler colors have been scattered away, similar to why the Sun on Earth appears orange or red when near the horizon. Notice the individual rocks poking up from the ridge in the foreground. Credit: NASA/JPL-Caltech/MSSS/Texas A&M Univ. On Earth, blue light from the Sun is scattered by air molecules and spreads around the sky to create a blue canopy. Mars has less the 1% of Earth’s atmosphere, so we only notice the blue when looking through the greatest thickness of the Martian air (and dust) around the time of sunset and sunrise. The video above of the setting Sun was made using stills taken by Opportunity, NASA’s “other” rover that’s been trekking across the Martian landscape for more than 10 years now. You can see a bit of pink in the Sun just before it sets as in the Curiosity photos, but there’s something else going on, too. Or not going on. When the Sun sets or rises on Earth, it’s squashed like a melon due to atmospheric refraction. Much thicker air adjacent to the horizon bends the Sun’s light upward, pushing the bottom of the solar disk into the top half which is less affected by refraction because it’s slightly higher. Once the Sun rises high enough, so we’re looking at it through less atmosphere, refraction diminishes and it becomes a circle again. I’ve looked at both the Opportunity sunset and Curiosity sunset videos many times, and as far as I can tell, the Sun’s shape doesn’t change. At least it’s not noticeable to the casual eye. I bet you can guess why — the air is too thin to for refraction to make much of a difference. Twilights linger longer on the Red Planet as well because dust lofted high into the stratosphere by storms continues to reflect the Sun’s light for two hours or more after sundown. So you can see that sunset phenomena on Mars are different from ours because of the unique qualities of its atmosphere. I trust someone alive today will be the first human to see and photograph a Martian sunset. Hope I’m still around when that awesome pic pops up on Twitter. Hey Bob! Before I even start reading the article I want to bring to your attention that the first image does not appear in the home page or after selecting the content. I wonder who the first amateur astronomer on Mars will be? Will he or she have to check the weather satellite(s) for dust storms or solar events before heading up to the observatory on Mons Olympus? Would Mars make a good location for spotting NEO’s lost in the sun’s glare? Not sure what’s up. I’m seeing it on my phone and computer both. Reload? I tried it in FF, IE, and Chrome, and it works in all three for me. Hmm. Now that image displays. No worries, no problem. It’s probably just me getting used to my new computer? er something. Maybe my iCloud is experiencing a thunderstorm or gamma ray burst overhead? That’s what I’ll tell the boss. Which visor`s shade do you recommend for maximizing the Martian sunset experience, Bob ? I’d still go with a #14 to be on the safe side. BTW, I’m reading an interesting sci-fi book about a guy stranded on Mars and how he tries to survive called “The Martian” by Andy Weir. You can tell the writer’s trying to keep it close to the facts. Sci-Fi fan? Me too… Life on Mars continued: I went out early this morning to check the seals on dome #4 and found a small micro meteor(?) hole. No problemo. I shot it with some sealant and then checked the pressure and it held. I visited the herb garden for some dill and tarragon then I couldn’t resist plucking a few fresh leaves off the abundant lettuce and spinach plants, then topped it off with celantro, tomato and avocado and made a lunch off that… The lemon tree needs pruning. It’s growing far too big for it’s location. Note to self: Move Lemon tree under apex of dome next to olive trees. Request larger dome… again. This reads exactly like the book “The Martian”. Are you reading it too? Oh really? No.. I haven’t read that yet, but will now! My take is that many of us are thinking about going to Mars and imagining how we’ll live once we get there…. and that’s a good thing! I just dove in and came up with the above. Is that a type of synchronicity or zeitgeist? i heard they are making a movie based on that book. edit: yep. i hope they don’t screw it up. Yes, just like the Sun fades as it drops through our lower atmosphere, likewise richer in dust and other aerosols peculiar to Earth like salt and smoke. UV sunsets.. hmm….. with suspended dust particles and supercool H2O vapors with CO2 layers bending the light? Speculation: the culture on Mars might be depressive absent more intense sunlight. On Earth very specific cultures have developed in places that get less sun and harsher winters, like say Bergman’s dark school of Swedish cinema. And a certain intensity to Russians that appears related to their climate. Here in Buffalo NY our dark month is Feb, when the length of winter and the depth of cold starts to test your willpower. But it does allow for things like refining one’s skills at a hobby and then the explosively beautiful and temperate summers seem almost dreamlike. If Mars is like an endlessly cloudy day all the time, how would that feel and affect its residents? A cloudy day’s equivalent but with sunshine. I suppose astronauts might want to pack a light therapy kit for any long-time stays. Good point! They probably want to illuminate their entire living domes that way I’d think. Yeah, yeah. I’ve heard it all. Actually we have more sunny days per summer than any other northeast city. And it doesn’t get stupid hot like in the south or NYC. 70s and 80s is fantastic. This is a remarkable image on its own, but that it represents selective scattering at its finest makes it that much more impressive. But there’s more. In a few images of the sequence, the Sun’s disk appears as white, which happens to be its true color, though the imaging is likely overexposed to get the white result. However, as the Sun sets, it should not appear as pinkish. The scattering of the redder colors to give us a blue horizon should also have the same effect for the Sun, much like a yellow horizon on earth give us a yellow solar disk. So the Martian sun should look either white (overexposed) or bluish-white due to selective scattering, certainly not pinkish or peach pinkish. A curiosity from … the rover.